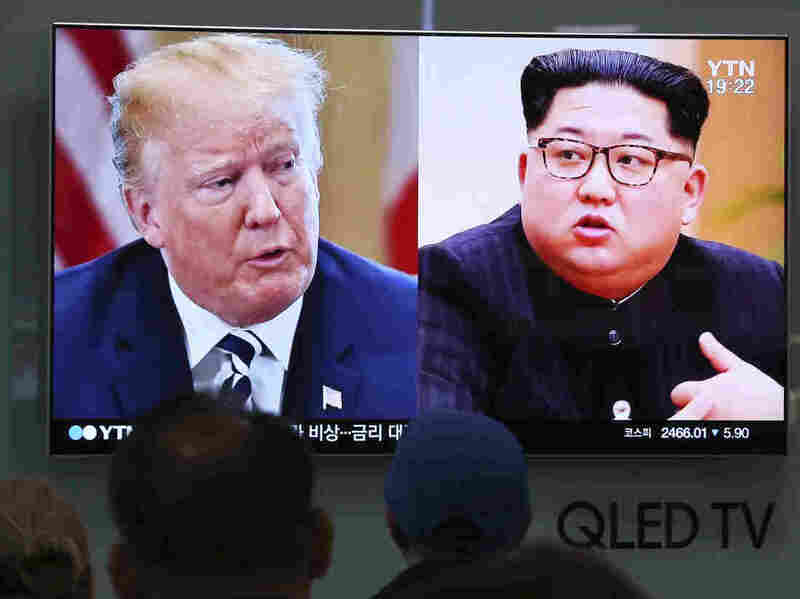 A war of words has scuttled a June 12 summit between President Trump and North Korean leader Kim Jong Un, seen during a news broadcast Wednesday in Seoul. Trump's decision comes hours after North Korean Vice Foreign Minister Choe Son Hui, in remarks carried on the country's official KCNA news service, said it would not "beg the U.S. for dialogue" and warned that it could make Washington "taste an appalling tragedy." Choe also called Vice President Pence a "political dummy" and criticized Pence's recent suggestion that North Korea could end up like Libya if doesn't come to the bargaining table. In calling off the meeting, Trump said Kim had missed an opportunity, but he left the door open to renewed talks in the future. "The world, and North Korea in particular, has lost a great opportunity for lasting peace and great prosperity and wealth," Trump wrote. "If you change your mind having to do with this most important summit, please do not hesitate to call me or write." Trump also returned to past form, boasting of the size of the U.S. nuclear arsenal. "You talk about your nuclear capabilities," Trump wrote. "But ours are so massive and powerful that I pray to God they will never have to be used." Later, appearing at a bill signing ceremony, Trump said the U.S. military is "ready if necessary" to respond if any "foolish or reckless acts" are undertaken by North Korea. He also said U.S. sanctions will remain in place. Trump held out the possibility that "the existing summit could take place, or a summit at a later date." He added, "Nobody should be anxious, we have to get it right." Trump said the dialogue between the U.S. and North Korea had been good "until recently." Trump said, "I think I understand why that happened" but would not elaborate. It appears Trump's decision to abruptly cancel the summit caught South Korea by surprise. "We are attempting to make sense of what, precisely, President Trump means," said government spokesman Kim Eui-kyeom. South Korean leaders called an emergency meeting to discuss the matter at midnight in Seoul. Testifying before a Senate panel, Secretary of State Mike Pompeo said the Trump administration was "fully prepared" for the summit. "I think we're rocking. I think we're ready." Democrats were skeptical that was the case, however. Sen. Bob Menendez, D-N.J., said Trump was discovering that "the art of diplomacy is much harder than the art of the deal." Speaking on NPR's Morning Edition, North Korea expert Joel Wit of the Stimson Center said the administration "mismanaged an important historic opportunity." Wit said, "I think it failed in the large part because the administration has no idea how to deal with the North Koreans. It failed because the administration veered from, you know, praise of Kim Jong Un, to making threats, to talking about the Libya model, which is really something the North Koreans don't want to hear about. It's been entirely too public in this process while we should have been focused on quiet preparations." Earlier in the day, North Korea made a public show of destroying its nuclear testing grounds. But the country's weapons program remains intact. "We can also make the U.S. taste an appalling tragedy it has neither experienced nor even imagined up to now," Choe warned in her statement. That statement was one of the factors the White House cited for Trump's decision to cancel the summit. In a background briefing with reporters, a senior administration official said Trump was briefed on the statement Wednesday night, "slept on it" and, after meeting with Pence, Pompeo and national security adviser John Bolton, dictated the letter to Kim on Thursday morning. It was one of a "trail of broken promises" by North Korea, the official said. North Korean officials also stood up a U.S. team led by deputy chief of staff Joe Hagin that had traveled to Singapore last week to work out logistics for the meeting. "They waited and they waited," the official said. "The North Koreans never showed up." NPR's Brett Neely contributed to this report.